In an exclusive this week, senior writer Gina Cavallaro details the newly approved plan to create three military occupational specialties for operators, specialists and officers assigned to Marine Corps Forces Special Operations Command. 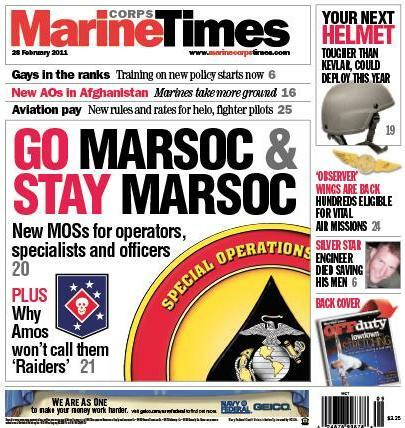 Plus, Cavallaro and San Diego bureau chief Gidget Fuentes team up to explain why the commandant shot down MARSOC’s effort to rename its units and personnel after the legendary Marine Raiders of World War II. Both stories came to light after Marine Corps Times obtained a detailed presentation provided to Gen. Jim Amos and his most senior general officers late last month in New Orleans. Amos, a self-described “big fan” of MARSOC, was easily sold on the idea of creating a career path for operators, as it is expected to help the command retain experienced Marines, while also serving as a huge incentive to those weighing the pros and cons of trying out for such an exciting and demanding job. Read more about these and other stories in this week’s print issue, on newsstands now. Can’t wait? You can subscribe here. All the cool kids are doing it.